Motorcycling Australia Historic Log Book No. MAO280. Racing No. 36. Historic Racing Period – Period 3. Year of Manufacture. 1961. Capacity. 250cc. Engine Description :- Single Cylinder, Single Overhead Camshaft, Narrow case engine with unit construction Five speed gearbox. Bore – 74 mm. Stroke – 57.8 mm. Frame Description :- Tubular steel welded single loop frame with swinging arm rear suspension with Koni suspension units. Front forks are telescopic oil damped type of Ducati design. Model Represented :- Monza / Mach 1. Note: The manufacturers claimed top speed for the road going models was 104 mph. The machine is not an original, but was ‘reborn’ from parts acquired. In Late 1999 I decided to build and race a bike and my choice settled on a Ducati mainly due to the influence of fellow QEMSC member Gene Lopeman, who at that time owned one. In early 2000 Gene put me in touch with Phil Hitchcock of Road and Race, a well known Ducati specialist. By September 2000 Phil had found me an engine and frame so the building could start. This was later followed when Phil found me front and rear wheels. Gene supplied the racing seat and various parts. Front forks came from a fellow in Forster NSW. The fuel tank was supplied by a member of the Ducati Owners club. The exhaust system was made by Club Member Rob Olsen. The finer points of engine preparation and tuning was done by Noel Watson of Duke Moto Services, Gold Coast. It was ready to race in time for the Corona Lakeside Classic 23-24 June 2001 and it was at this race meeting it made it’s debut. Since that time it has proven to be reliable and very forgiving to the rider. 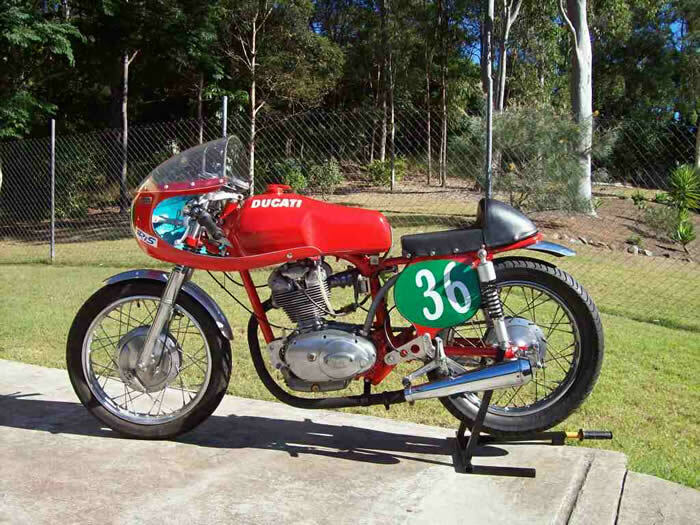 It is a good honest example of Ducati’s early design and production. 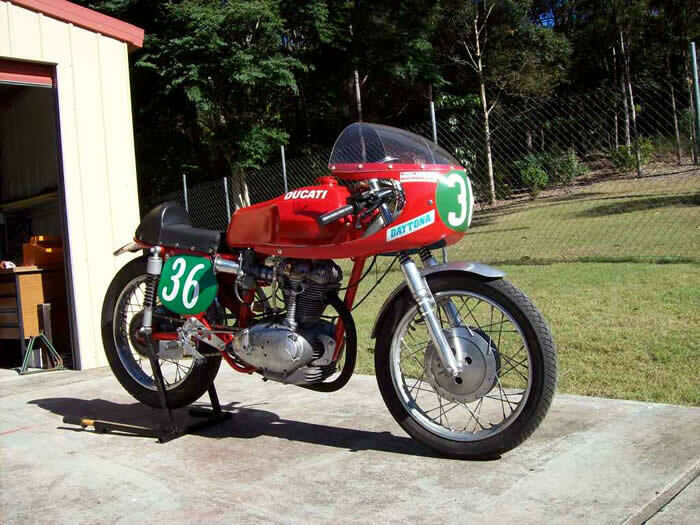 As a point of interest since completing the Ducati I have restored an AJS 650cc twin, 1962 model 31. This is a road machine and again all built from parts sourced. Click to see pics.